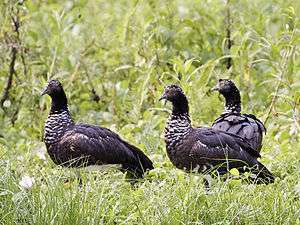 The horned screamer is a massive 84–95 cm (33–37.5 in) long, 3.5 kg (7.7 lb) bird, with a small chicken-like bill. The upperparts, head and breast are black, with white speckles on the crown, throat and wing coverts. There is a long spiny structure projecting forward from the crown. This structure is unique among birds and is not derived from a feather but is a cornified structure that is loosely attached to the skull and grows continuously while often breaking at its tip it has very long and lanky legs and three large toes in each. This gives this species its name. The belly and under wing coverts are white. It has two sharp spurs on its wings, and feet which are only partially webbed. The horned screamer's call, as its name suggests, is a very loud echoing sound.It is called"El Clon-Clon" in Ecuador because of this peculiar feature. ↑ BirdLife International (2012). "Anhima cornuta". IUCN Red List of Threatened Species. Version 2013.2. International Union for Conservation of Nature. Retrieved 26 November 2013. ↑ Stettenheim, Peter R. (2000). "The Integumentary Morphology of Modern Birds—An Overview". American Zoologist. 40: 461–477. doi:10.1093/icb/40.4.461.